The Family Room Reveal - Oak House Design Co. I shared a photo on Instagram a while back with the Honey We're Home Loves Bloggers tag, and it made me realize I have never really shared my family room on the blog. I think it's because it's been in a slow but constant state of flux. But isn't that how most rooms are? We keep tweaking them to get them just how we want them and to fit whatever stage of life we're in. So I made a few small changes recently and thought I would share it. Even though it's never quite finished in my mind, that's ok, right? For years I wanted a neutral palette, so probably three years ago I changed from muted green stripes to this custom mixed french grey. In fact it was this leftover paint that I used on the Dining Room Bookcases to tie the two spaces together. I have been thinking of changing it over to the creamy white that I have on the dining room walls, but I love this color too. 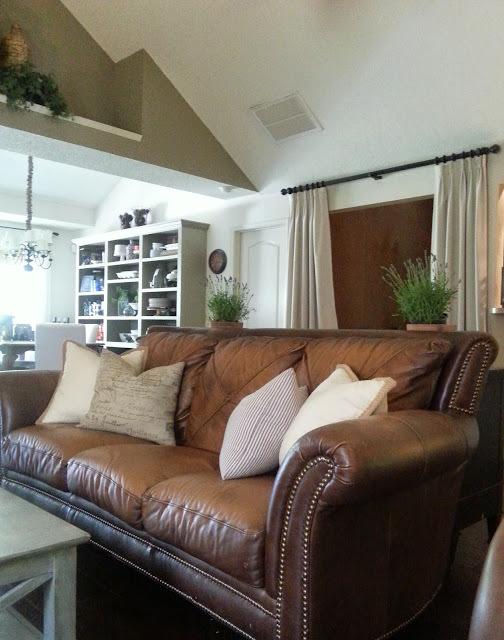 The most recent change I've made was to add higher side tables flanking the loveseat. The previous ones weren't bad, but they weren't quite to scale. So much better! The one on the left was a find at Marshall's. The one on the right is actually an outdoor table I got on clearance last summer. It was the perfect height to complement the wood table. I had just enough linen fabric left over from a previous project to whip up a tablecloth. Previously you couldn't set a drink down on the small table, but now you can not only see it, but use it. And it actually feels cozier to sit over on this couch. Everything in this room except for the sofas and the wood side table is either a thrift store/garage sale/clearance find or DIY project. 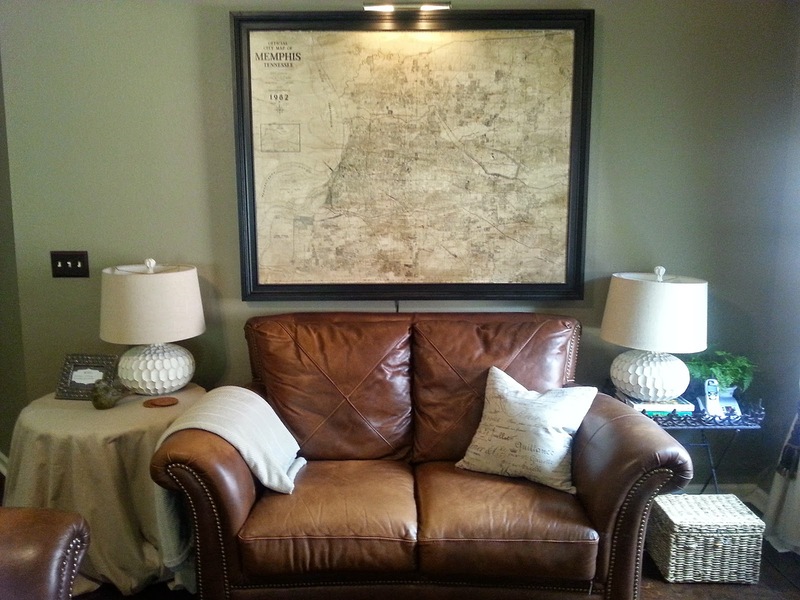 One of my favorite DIY's of all time is the map over the sofa. It had been rolled up in a closet at my mom's house for years and I thought, I am going to frame that. I will have the share a tutorial in the future. But maybe that's why I love this space so much...because it's been collected and put together over time. 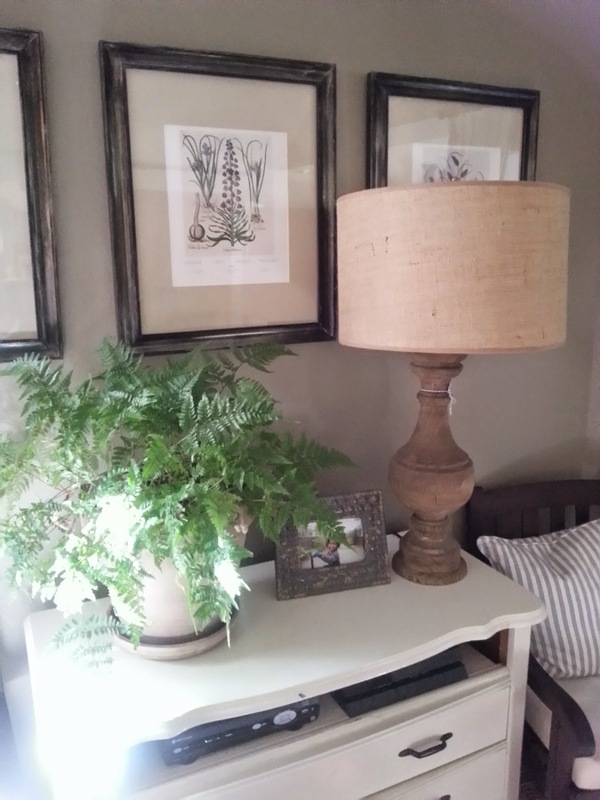 One of my most favorite thrifted items is this vintage Drexel Heritage dresser that sits behind the sofa. I scored it for $45 at Goodwill! Can you believe I originally left it because I felt $65 was too much? I went home and thought about it and decided it was worth it. Even better, by the time I got back they had marked it down! I need to repaint it and the coffee table (the right way- using primer) because the top is showing wear. But I love that it serves as a secondary landing spot from the entry, and it serves as a buffet/drink station/dessert station for parties since my dining room doesn't have one. So that is the current state of the family room. Seeing these pics makes me realize I really want a rug for the room. I had always intended to get one, but other projects/etc have taken priority with my budget. I'm leaning toward a jute one, but I'm not sure how it will hold up to kids and spills. I also realize I really need to repaint the coffee table. I am thinking of going with a darker shade of the wall color. I've got a few other ideas and tweaks up my sleeve, but I will save them for another day!